After spending several years as an art director/graphic designer in Philadelphia, San Francisco and Chicago, my life took an about-face, and I moved to a Wisconsin farm, set up shop in a little milk house and married my farmer guy. I couldn’t be happier. I have a slap-happy barn dog named Bowzer B. Dawg, a stray cat that came in from the cold named Gray Ghost, and an herb garden that’s teaching me a thing or two. After years of living in small apartments, it’s nice to be able to simply step outside my door and into grass, trees, fields and sky. Being here on the farm, with a lovely husband who is quite patient, I’m getting back to my sewing, drawing, and even some renovating standard for an old house and barn. I’m surrounded by corn fields and Holsteins and quite like it. By day I continue to work in the graphic design field for a sewing/notions company which is a pretty good thing. I can’t say I excel in any one thing in life, but I do have fun trying. And maybe that’s a little bit what this blog is about, me trying…in an environment to which I am relatively new but have embraced wholeheartedly. Graze, enjoy, and thank you for visiting! Hey Micka! Love the studio. Hope you’re well. I enjoyed reading, and seeing all of the photos, on your blog. I found it very interesting. 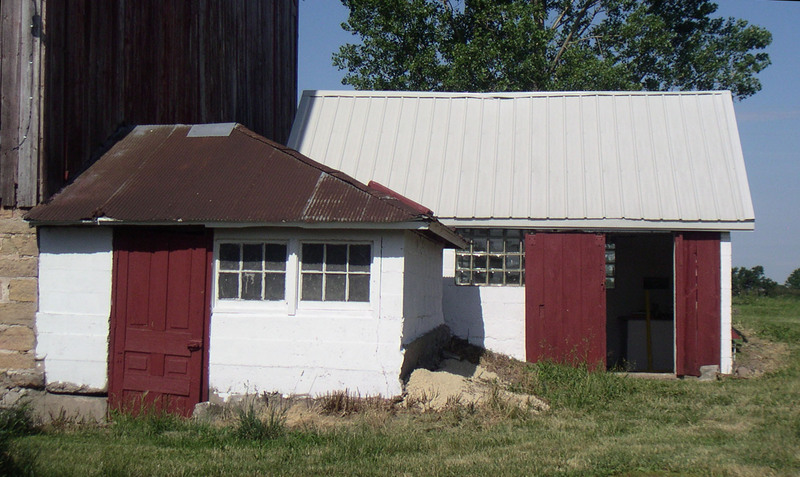 I went from being a city girl (Sheboygan…yes, I know your mom) who after having 3 children (baby 3 months old) we bought an old, old farm house with no running water…no running water means no inside toilet. And that is why your Milk House Studio brings back memories. Keep up the good and interesting work. Thank you so much for writing this blog! One of my closest friends sent it to me this morning and I’m so grateful. You are a wonderful writer who made me smile on a dingy, gray day in NYC. My roots are on a dirt road in Central New York, a place I intend to return to soon….when I find my farm, farmer and dog. Until then, I will live vicariously through you and enjoy every minute. Stay warm & enjoy! Your welcome! And it’s great to hear from you…I grew up in the Hudson Valley region so naturally I love New York. So yes, find yourself a farm, farmer and dog and get yourself back up there! I’m glad I could make you smile on a gray day in the city…you stay warm as well! Your site is a wealth of information. I’m more than impressed! And I’m so glad to hear from you Roy, you have impressed me as well! Hey Micka! I saw your parents this weekend while I was visiting my mom. They look great! Hope all is well with you! Hi Dawn, it’s great to hear from you! I’m glad you got up there to see my parents. I’m sure they were thrilled to see you!